Oliver Holmes in action for Castleford Tigers against Catalans Dragons, when he scored two tries. Picture: James Hardisty. 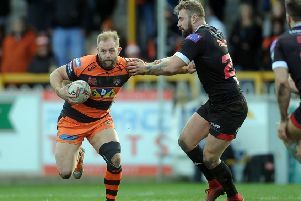 Castleford Tigers returned to their best form as they overwhelmed Catalans Dragons 41-0 in a strong all-round display at a much drier Mend-A-Hose Jungle. Man of Steel half-back Luke Gale was the architect of a smart attacking game with some outstanding defending also catching the eye as the Dragons were prevented from scoring despite having several opportunities near the home line. It took Cas a while to get points on the board, but they quickly established control with only desperate defence keeping them out in the opening 10 minutes. Catalans did threaten once when Tony Gigot’s grubber kick was superbly defended on his own line by James Clare. A clever kick at the other end by Luke Gale forced the first goal-line drop-out of the day and the pressure was maintained until the Tigers opened the scoring on 14 minutes. Gale’s high kick was well collected by full-back Jake Trueman and he offloaded to Paul McShane, who then had an easy job to go over for the first try, to which Gale added the conversion. Another Gale high kick resulted in a second home try soon after as Michael Shenton leaped well to collect and get the ball down over the line. Gale’s conversion made it 12-0. Gale’s next kick forced another drop-out after Grant Millington bulldozed down the middle on a great break. From the next set, Oliver Holmes chased Gale’s perfectly judged kick and dived on the ball over the line for the third try. Gale again goaled. Catalans had a better spell with Samisoni Langi’s kick forcing a drop-out and another Langi kick having to be well defended by Greg Minikin. But the Tigers went close again when Shenton knocked on over the line trying to touch down McShane’s grubber kick. Just before half-time Gale took the chance to pop over a drop-goal and it was 19-0 at the break. After recent disappointing second half displays from leading positions, Cas continued their good work into the second half this time and Clare - enjoying his best game back at the club - almost came up with a great individual effort as he collected his own kick through, but his offload near the line was not picked up by a team-mate. The visitors briefly threatened as Gigot lost the ball over the line, but the action was soon back at the other end with McShane going over for his second try after pulling off a brilliant runaround move with Adam Milner. Gale goaled and was on target again three minutes later after a classic Cas try finished by Clare following a top notch left edge move and a superb flicked pass by Shenton. The game dipped for a bit following this, but the Tigers were determined not to let their opponents back into it with some outstanding goal-line defence denying Ben Garcia, Ben Julien and Julian Bousquet. Matt Cook got Cas back on the attack with a strong burst and from the next play Ben Roberts sent in a grubber kick that Joe Wardle did well to reach and ground over the line for his first try for the club. Another try quickly followed as Gale’s high kick was caught by Clare, who passed inside for Holmes to charge over for his second of the afternoon. Gale added the conversion and the scoring was complete at 41-0. The Dragons put on some late pressure, but it came to nothing with more determined defending ensuring the French team were nilled. Scorers - Castleford: Tries McShane 2, Shenton, Holmes 2, Clare, Wardle; goals Gale 6; drop-goal Gale. Castleford Tigers: Trueman; Minikin, Webster, Shenton, Clare; Roberts, Gale; Massey, McShane, Watts, Holmes, Wardle, Foster. Subs: Millington, McMeeken, Milner, Cook. Catalans Dragons: Tierney; Broughton, Thornley, Mead, Yaha; Langi, Gigot; Simon, McIlorum, Moa, Julien, Garcia, Baitieri. Subs: Casty, Bousquet, Margalet, Da Costa.